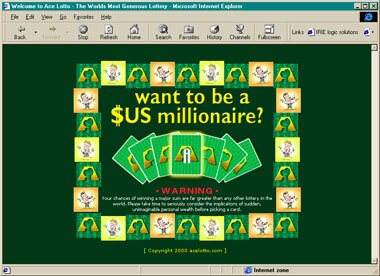 Create a web based lottery game with full MLM facilities to encourage member participation and membership growth. The site must be fully automated with comprehensive administration facilities to monitor its success. The client dictated that they would like to avoid the use of fringe technologies such as Active-X and Flash to suit as much audience as possible. After initially acquiring hardware with enough redundant capabilities to satisfy the requirements of being locked away in a foreign country we set about creating a stand alone system that not only performed automatically but incorporated complete remote administration. 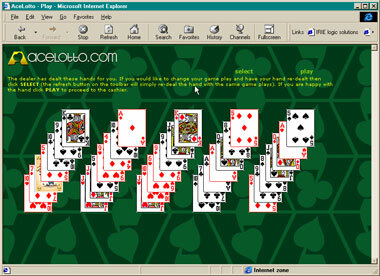 The game itself made extensive use of dynamic HTML to simulate card movement when manually selecting hands along with C++ ATL COM components for all major logic throughout the site. C++ ATL was chosen to construct the logic components providing optimum performance with multiple users under high load. The database utilised SQL server along with Windows 2000 Server for the base operating system. Unfortunately circumstances beyond the control of the client with regard to foreign banking licenses meant that the site was never actually used in a live environment although the final product did satisfy all of the client requirements along with some innovative ideas. Secure credit card processing was performed with Transactor 2000 to administer membership and game fees in real-time.